Habits are hard to break! That’s why it is absolutely necessary to instill healthy habits in our children at a young age. Regular chiropractic adjustments restore nervous system function, which allows the growing and changing body to experience optimal health. Bones model in response to the stresses placed upon them, and children suffer stresses on their body just as adults do. Since a great deal of physical stress can occur during birth, many parents opt to have their newborn’s spine checked. You may also consider a spinal check when your child reaches developmental milestones, as holding the head up, sitting upright, crawling, and walking all affect spinal alignment. Additionally, athletic injuries, growing pains, and poor posture are all physical strains to a growing child’s developing spine and nervous system. Many childhood issues lead families to Dr. V, such as birth trauma, breastfeeding issues, plagiocephaly, colic, constipation, ear infections, and bedwetting. 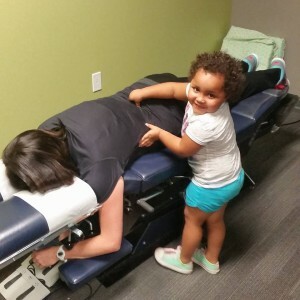 Most kids love getting their spines checked! 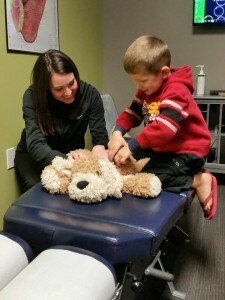 Dr. V’s gentle techniques used to adjust children of all ages makes each visit a fun experience! Chiropractic adjustments to your newborn uses no more pressure than you’d use to test the ripeness of a tomato.